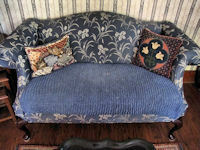 Hearts Desires is dedicated to bringing you vintage linens & textiles. 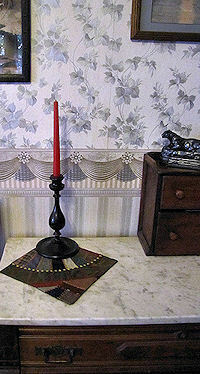 These and other specific categories of vintage linens and textiles may be found in the site map to the left. It may seem a long, long way from the starter apartment to the mansion on the hill; but these and all of the homes in between have something in common; the homemaker in each is trying to make it as lovely as she can.  Sherwin Williams has 184 shades of white, and the homemaker may spend hours (or even days) choosing just the right one for the hall woodwork. When it comes to more important decorative decisions, there may be even more choices. You want your home to reflect your lifestyle and your taste. And, of course, if you, like most of us, are working within a budget; you want the most "bang for the buck". Even if there are two hundred identical ranch-style houses in the complex, you can make your home uniquely yours. 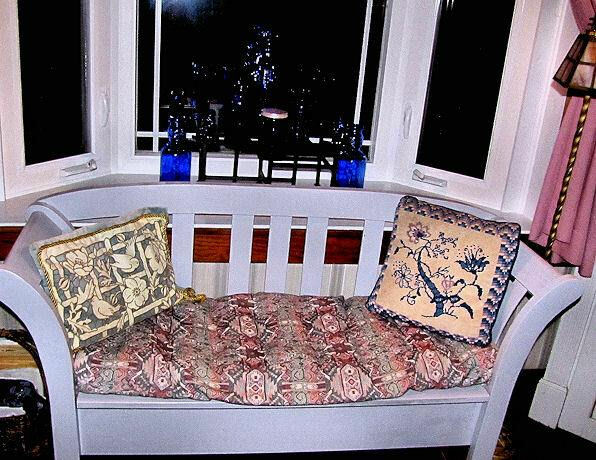 Consider decorating with vintage linens and textiles. It's about the look; and then it's about how the look makes us feel. Vintage linens and textiles add an unmistakeably individual look to all parts of your home. And then, the comfortable, homey feeling begins. There's nothing like it. Vintage linens and textiles add that mellow charm that makes a house a home. They show that you cared enough to hand-pick each piece; a far cry from picking up the phone and ordering co-ordinating everything from a Bed And Bath catalog. Each piece has its own unique character. 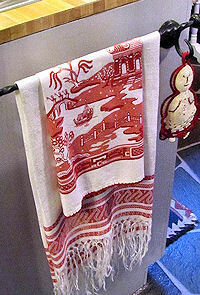 You can sense a bit of history behind even the smallest embroidered linen doily or set of hand-hemstitched napkins. You appreciate the handwork of the maker. 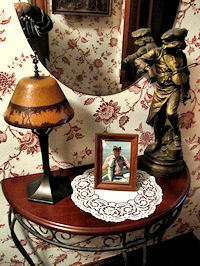 A special, homey feeling seems to be carried on from a gentler generation. Vintage linens and textiles are comfortable; they have already been lived-with and loved and survived to live again in your home. 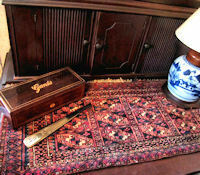 Although vintage textiles inspire respectful handling, you, your family and guests don't have that touch-me-not feeling. 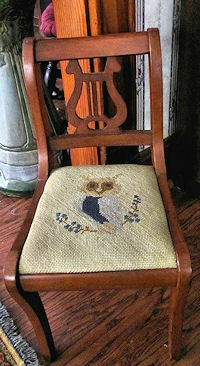 Most vintage linens normally show a little gentle wear; and you are only continuing the process. Walmart and K-Mart and Sears and even Saks Fifth Avenue; they all display the latest styles, in this year's most popular colors. According to your preferences and pocketbook, you can decorate your table with a runner in peach linen-look satin damask with tassels at the ends in each and every one. And so can your neighbor, your sister-in-law and the boss's wife. This wasn't always the case. Homes and home furnishings weren't always mass produced. It was up to each family to make the most of their own resources and talents. Each homemaker decorated her home with her own hands; needle, thread, sewing machine and crochet hook were the tools of her trade. 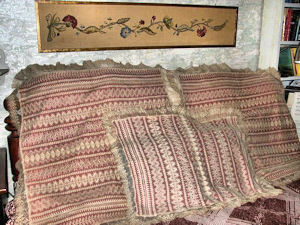 She chose basic linens and textiles and adapted them to her own needs, using her own skills. Maybe, daughter Sue likes ducks, her favorite color is pink and her bureau is long and narrow to fit under the window overlooking the pond. OK, Mom chooses pink linen fabric, cuts it to complement the bureau, embroiders a family of ducks and ducklings across the center and crochets a ruffly pink lace around the edge. After a long, hard day Dad likes an extra-large pillow for his back, he likes bold geometric patterns. 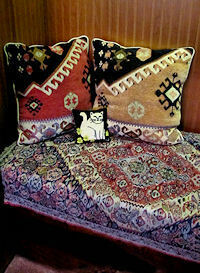 Mom can do it; the unworn corner of an old oriental rug, some backing fabric and lots of stuffing; it's perfect. That's the way it was. 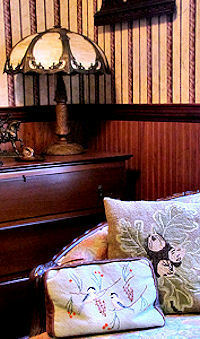 The resulting array of vintage linens and textiles available today makes home decorating a never-ending pleasure. With a little imagination, every room in your home can be individualized with vintage linens and textiles. Get away from the boring concept that everything must match; who says so? Except for the obvious, such as pairs of curtains, matching is over-rated. Co-ordinate instead. Think of keeping sizes, colors and styles in perspective. Patterns can be mixed and matched if the pattern sizes are unequal and contain a common color. You'll achieve a much more interesting effect. Sometimes it's not easy to visualize the original situation for which the linen or textile was created, or a set seems incomplete, or it's flawed, or you don't quite have the place; but you really, really like it. Think outside the box. Re-purpose. You can't expect your situation to duplicate the original. 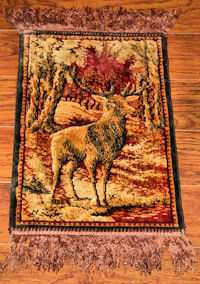 A vintage textile can be versatile; it may have begun its life as a linen towel with designs and fringe on either end, but it exactly fits your dining room table; if you say it's a table runner, then it is a table runner. Everyone likes to re-decorate. A few vintage linens and textiles can give your room a whole new look any time you like. Many can travel from room to room. They're easy to change and rearrange, easy to store, easy to put back. 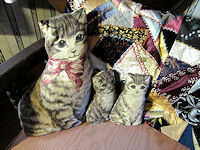 So, by now these one-of-a-kind linens and textiles are vintage, or even antique. You will seldom find two the same, even if you try. There is an infinite variety; so much to choose from, and each one different. Of course, not one of these individual items is available at the mall. 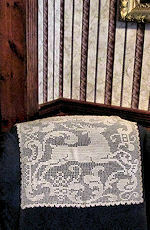 You find vintage linens and textiles at antique shops and shows and online linen and textile sites. Shopping is fun, a treasure hunt; you never know what you'll come across next. Another advantage to buying vintage linens and textiles: they are almost never more expensive than their counterpart items at the mall; usually less. If the item has a flaw that you can live with, it will be downright cheap. 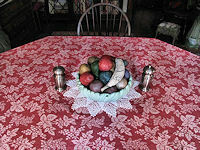 Consider the centerpiece doily to the left, how much would a spot in the center detract? After all, vintage textiles, by definition, they've been around. 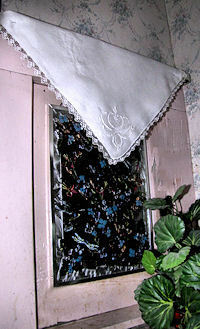 The linens and textiles pictured in this article aren't for sale. They're from my personal vintage collection; pictured only to spark your creativity. 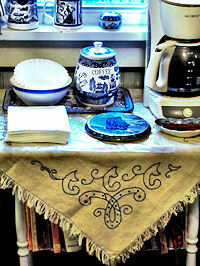 Click on any category in the "Linens For Your Home" box to the left; see what's available today from Hearts-Desires. Enjoy browsing and enjoy decorating your home.